(TibetanReview.net, Nov25, 2017) – In what will surely be seen as a small victory for Tibet and human rights issues, China’s under-20 soccer team’s series of friendly games against 16 fourth-tier clubs in Germany has been postponed Nov 24 because of the Tibet protests it was going to face. The German soccer federation said in a statement that it had “substantial evidence of further escalation” against the team, reported the AP Nov 24. 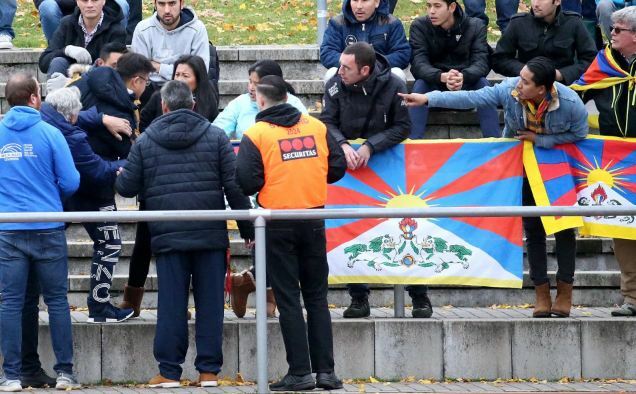 The Chinese under-20 team had walked off the field during the first half of its game at fourth-division club TSV Schott Mainz on Nov 18 in protest against Tibetan flags being displayed by a small group of spectators. The visiting Chinese team was otherwise scheduled to face FSV Frankfurt for the second of its friendly games against teams from Germany’s southwest division on Nov 25. But that match – and the following scheduled games against Hoffenheim’s second team and Wormatia Worms – now stands postponed at least until the winter break, the report said. And there is no information yet when at all the games will take place. The Chinese team was invited to play friendly games on free match-days made possible because of an uneven number of teams in the league. Only 16 of the league’s 19 teams agreed to participate in the one-off action, which was meant to help China’s under-20 team prepare for the 2020 Tokyo Olympics. The Chinese action of storming off the pitch during the Nov 18 match was seen as overreaction in Germany while the German federation president Reinhard Grindel defended the fans’ right to peaceful protest. “It has been made clear to the Chinese federation that when you play in Germany you also have to deal with the fact that anyone can express their opinion,” Grindel was quoted as saying this week in response to criticism from Chinese foreign ministry spokesman Lu Kang. Lu had said the country firmly opposed any “separatist, anti-China or terrorist activities” defending Tibet and called for “mutual respect” from Germany as host toward its guest. The scmp.com Nov 25 also quoted Grindel as saying, while not directly addressing Lu’s comments, that he would “be happy if the Chinese soccer federation concentrated on the chance for its under-20s to play friendly games at a good level”. The decision to invite the Chinese team was criticised from the very beginning for some other reason as well. Three teams – Waldhof Mannheim, Stuttgarter Kickers and TuS Koblenz – had refused to take part in the series of games against the visiting Chinese under-20 team despite a 15,000 euro ($17,700) bonus for each club. The report noted that fan groups and team officials had blasted the federation for “excessive marketing of soccer” and for putting its own interests ahead of the clubs.